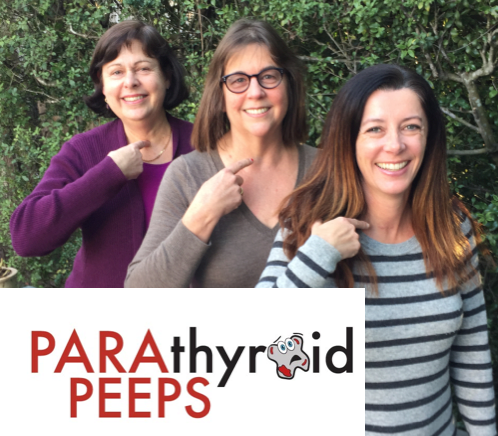 Help me welcome Barbara Creamer, Joyce Arnon and Sophie Freedman, also known as, the Parathyroid Peeps. Primary hyperparathyroidism is a secondary cause for bone loss, so the ladies are helping to raise awareness and understanding of this little-known disorder. Bio of Parathyroid Peeps: We are 3 San Francisco Bay Area women sharing our personal journeys of overcoming the debilitating symptoms of** primary hyperparathyroid disease** through surgical removal of our non-cancerous adenoma(s). Our purpose is to raise awareness and advocate for improvement in diagnosis and standards for surgical treatment of primary hyperparathyroid disease. What is primary hyperparathyroidism (pHPT)? Hyperparathyroidism is the illness that results from too much parathyroid hormone. 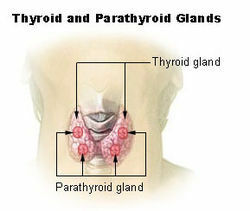 There are four parathyroid glands that are each the size of a grain of rice and are usually located behind the thyroid gland. These four glands regulate calcium in the body.Primary hyperparathyroidism results when one or more adenomas (non-cancerous tumors) form in one or more of the parathyroid glands and secrete too much parathyroid hormone (PTH), which disrupts calcium regulation, leading to hypercalcemia, or high calcium in the blood. Hypercalcemia has several bad consequences. As a result of calcium being leached from the bones due to high PTH, primary hyperparathyroid disease can be a root cause of osteoporosis. Ladies, how is primary hyperparathyroidism (pHPT) diagnosed? Low vitamin D-25 (normal = 30 - 100 ng/ml). *Note that normal lab ranges may vary from lab to lab. According to the experts at the Norman Parathyroid Center, persistent calcium levels 10.1 and above (in an adult) is almost always a parathyroid tumor. Approximately 20-25 percent of cases don’t present classically. Normohormonal primary hyperparathyroidism occurs when calcium is high, but PTH is still within the normal range. Normocalcemic primary hyperparathyroidism occurs when calcium is in the normal range, but PTH is elevated. Additional lab tests including ionized calcium and urine calcium may be helpful in making the diagnosis when the presentation is not classic. What are the symptoms of pHPT? There are many. The mnemonic Stones, Bones, Moans, Groans, and Psychic Overtones is one way the medical community refers to symptoms of pHPT.These include, but are not limited to, bone and joint pain, osteopenia, osteoporosis, kidney stones, heart fluttering or palpitations, heart attack, hair loss, inability to sleep through the night, brain fog, gastrointestinal distress, GERD, anxiety and depression. Symptoms are often vague and erroneously attributed to various conditions such as menopause, osteoarthritis or psychiatric disorders; although a parathyroid adenoma later proves to be the root cause of the patients’ symptoms. In most cases the cause of primary hyperparathyroidism is unknown. Some believe that previous radiation therapy to the neck, radioactive iodine therapy for thyroid problems and past use of the medication lithium may be causes. There are rare genetic occurrences, as well as possible environmental causes of the disease. How is pHPT connected to bone loss? The parathyroid glands normally regulate calcium in the bones and blood very precisely and keep the blood levels of calcium in a very tight range. Calcium is needed in many cells in our body for proper function and for nerve cell communication. When calcium in our blood is too low, normal parathyroid glands release PTH, which pulls out calcium from the skeleton, which is the storage depot for calcium in our bodies. When there is too much calcium in our blood stream, the parathyroid glands shut down, and the excess calcium is returned to our bones. When an adenoma forms, the gland goes haywire, becoming unregulated and producing excess PTH. The excess hormone pulls calcium out of the bones continuously, even if there is already too much calcium in the blood. This leads to porous, brittle bones known as osteopenia and osteoporosis. Continue on to Part 2 of the interview, which covers the complications, personal experiences, medications and advice for primary hyperparathyroidism!